Well, I met a “cool mom” named Gail at Shea, and not surprisingly, her 13-year-old son named Clif (short for Clifton) was awesome. They were my Watch With Zack clients for the day, and the fun started even before the stadium opened. I’d brought a ball so Clif and I could play catch, and from the moment he reached out and gloved my first throw, I could tell he was athletic. I mean really athletic–the kind of athleticism where it didn’t take him a shred of effort to catch anything I fired his way. 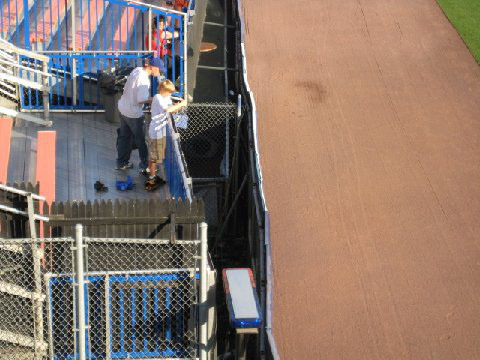 I knew he’d have no problem snagging baseballs during batting practice. When we finished throwing, Gail had a surprise for me. Not only did she give me one of her three season tickets, but she also handed over a ticket for the left field bleachers! By the time I ran into the bleachers and took this photo, I’d already snagged my first ball. There’d been a Shea employee standing around behind the bleachers with a ball in his hand, and before I ran up the steps, I asked him if I could have it and he tossed it to me. Did Clif want the ball? No. To say the least, he’s a big fan of my baseball collection. While he wanted to snag as many balls as possible and try to break his one-day record of three, he didn’t want to do anything that would interfere with my snagging. In fact, he wanted me to have a huge day. He wanted to see me in action, and he wanted to witness a milestone. I started the day with 290 balls for the season. He was hoping I’d snag 10 more to reach 300. He said he’d read every one of my blog entries “at least three times” as well as everything on my web site. At one point, when his mom asked me where I grew up, Clif shouted “Manhattan” and quickly apologized (unnecessarily) for answering for me. Later on, when I told him I’d gotten the lineup cards the previous night and made a comment about how tough it is to get them in New York, he reminded me that I’d gotten the lineup cards at Yankee Stadium on the day I snagged my 3,000th ball. And then, just for the hell of it, he told me that I’d also gotten the lineup cards in 2005 in Cincinnati from Felipe Alou on the day that Randy Winn hit for the cycle…and that I got them two days later in Houston from Dusty Baker…and that my record-breaking 20th ball of the day at Chase Field was tossed by Tony Clark…and that when I got No. 21 soon after, the home plate umpire rolled it to me without looking up. I didn’t feel stalked. I wasn’t scared. I didn’t think it was weird or creepy that he’d memorized so much stuff about me. I can only say that I was flattered. I quickly snagged my second ball by getting Mike Pelfrey to toss one up, and moments later, Clif (aka “goislanders” to those who read the comments on this blog) found a ball sitting in the aisle of the center-field end of the bleachers. 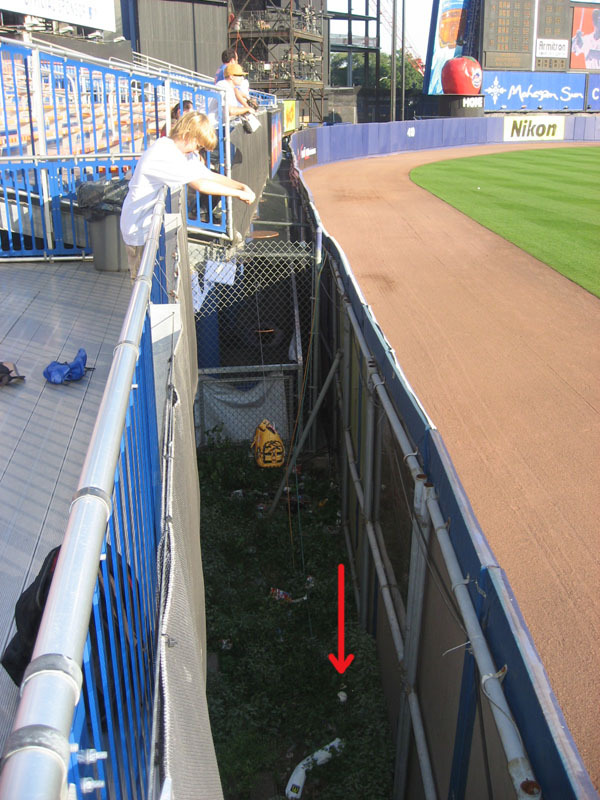 For the first 10 minutes, we had the picnic area to ourselves, so when a homer ended up flying down the staircase and bouncing all the way across the picnic area to the edge of the Citi Field construction site, I was able to chase it and pick it up without any competition. Was I dreaming? This wasn’t just better than anything I’d experienced at Shea; it was better than anything I’d experienced anywhere. Gail was still hanging out in the main portion of the stadium, capturing our every move with her digital camera. CLICK HERE to watch a 10-second video in which we’re both going for balls. You’ll hear her reaction as Clif gets his second ball tossed by Willie Collazo, and at the very end, you’ll see me on the right side using my glove trick to knock (what ended up being) my fourth ball closer to the outfield wall. After several fans had made their way into the bleachers, Clif spotted a ball in the gap behind the outfield wall, and I stood beside him as he set up his glove trick. The ball was half-buried in the weeds, and it was almost too far out for him to reach, but he managed to knock it a couple inches closer, and when he did, we were both disappointed to discover that it was a fake ball. Clif only saw a fraction of the logo, but he instantly recognized it from an entry I’d written two years earlier and knew that it said “Donated by The New York Mets Foundation.” I’d found a few of those balls at Shea and decided not to count them, so Clif didn’t even bother going for it. He just reeled in his glove, and we kept running around. Aaron Sele tossed me my fifth ball, and Clif tied his record by getting #3 from a cameraman. I ran over and gave him a high five. Gail, by that point, had made her way into the bleachers, but she’d just missed getting a picture of the celebratory moment so we reenacted it. Clif deserved the next ball, but in a bizarre (and split-second) turn of events, I ended up being the one who snagged it. We were standing on opposite sides of a fenced-off railing when Clif happened to spot a ball sitting in the front row on my side. “Hey, there’s a ball there,” he said, and without thinking, I looked down and picked it up. “Did you drop one of your balls?” I asked. He checked his backpack and counted all three of the ones he’d snagged. I looked inside my bag. I had all five. Turns out it was just a random ball that had been sitting there all along, and no one had seen it. We then had a long discussion about who deserved it. Each one of us wanted the other person to have it, but Clif insisted, and Gail took his side. “He wants you to have the ball,” she said. I numbered it and stuck it in my bag and felt completely guilty, but Clif seemed to be excited that I was now just four balls away from 300. Thankfully, the day was still young, and when the Nationals took the field, he broke his record by getting a ball tossed to him by Winston Abreu. 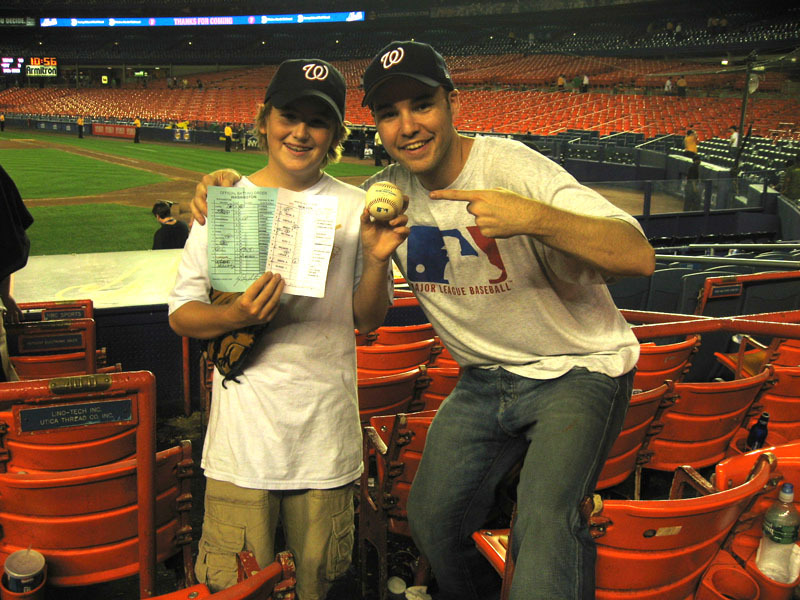 Then, within a matter of minutes, he added to the record when the 6-foot-11 Jon Rauch saw his Nationals cap and threw him ball #5. That’s when I went on a tear, kicked off with a “ridiculous catch” according to fellow author and MLBlogger Zoë Rice, who posted a pic of us and described a little more of the action in this entry on her blog. Basically, what happened is that a right-handed hitter on the Nationals–no idea who–pulled a long fly ball that was clearly going to fall short of the bleachers. I knew it had a chance to hit the warning track and bounce in, so I raced to my right through the wide aisle, and sure enough, the ball skipped up over the wall. As the ball was about to land in the benches, my path got blocked by a slanted railing, so I stopped short and reached out as far as I possibly could and made the backhand catch. I reached so far (and hadn’t quite stopped my momentum) that I began to topple over the railing headfirst. I braced my fall with my glove and dangled over the railing for a good two seconds before I felt someone grab my feet and help me back up. Five minutes later, I raced to the far end of the bleachers and asked Nook Logan for a ball as he was about to toss it to another fan. That other fan happened to be Gail, and after Nook gave it to her, he noticed that I was wearing a Nationals cap, so he said, “I got you, Dawg,” and quickly got another ball for me. 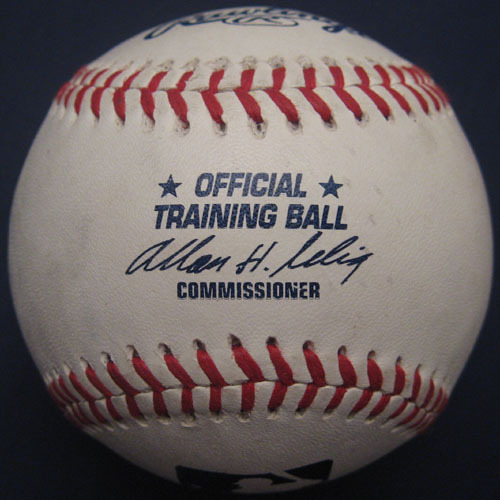 (The Nationals were using those awful/cheap training balls.) Nook ended up tossing one to Clif as well, and just like that, my snagging accomplice had doubled his one-game record. After I got my ninth ball of the day–and 299th ball of the season–thrown by Joel Hanrahan, Clif and I saw another ball land in the gap. He knew it was going to be #300 so he wanted me to go for it. Even the security guards wanted me to go for it, if you can believe it, because a few of them had heard about my glove trick but hadn’t yet gotten to see it in action. Down the steps I went. I set up the rubber band and then the Sharpie. I let out some string to make sure it wasn’t tangled and lowered my glove for the easy snag. Then I used the trick again to grab the “Foundation” ball, and I gave it to the security supervisor so she could give it to a kid. Just before I was about to head up the steps, I happened to notice that there was ANOTHER ball, sitting in the aisle right next to me, tucked slightly behind a large plastic garbage can. So I picked it up. And that was my 11th ball of the day. Crazy stuff. The whole section was buzzing about me. The security guards were in awe. The fans recognized me from TV. No one was annoyed that I’d snagged so many balls. There had been plenty of others to go around. The few kids out there had all gotten balls on their own, and some of the grown-ups had caught balls as well. Everyone was happy. It was a snagging love-fest. Toward the end of BP, Gail and I were standing next to each other in the aisle when another Nationals righty connected on a deeeeeeep fly ball. The ball was heading about 50 feet to my right, and I knew it had enough distance. All I had to do was start running and make sure that I didn’t bump into the few gloveless fans standing in my way. I kept running and looked up at the ball. I kept running and looked < back down to make sure my path was clear. I kept running and looked back up, and before I knew it, I’d reached the end of the aisle and ball was coming in fast. I reached over my head and felt the ball smack the pocket of my glove, and I when I looked back down again, Clif was standing five feet in front of me. 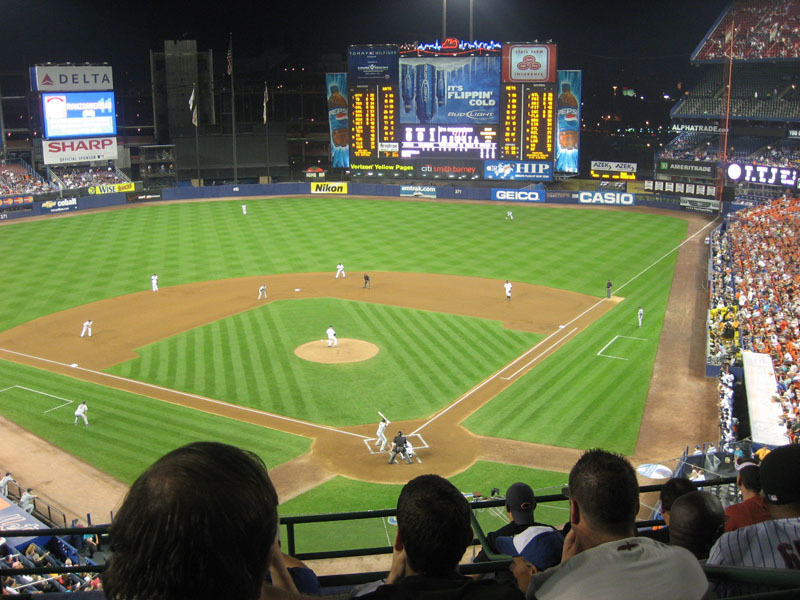 Most of the newer ballparks have been designed to let fans watch the pitchers warning up. 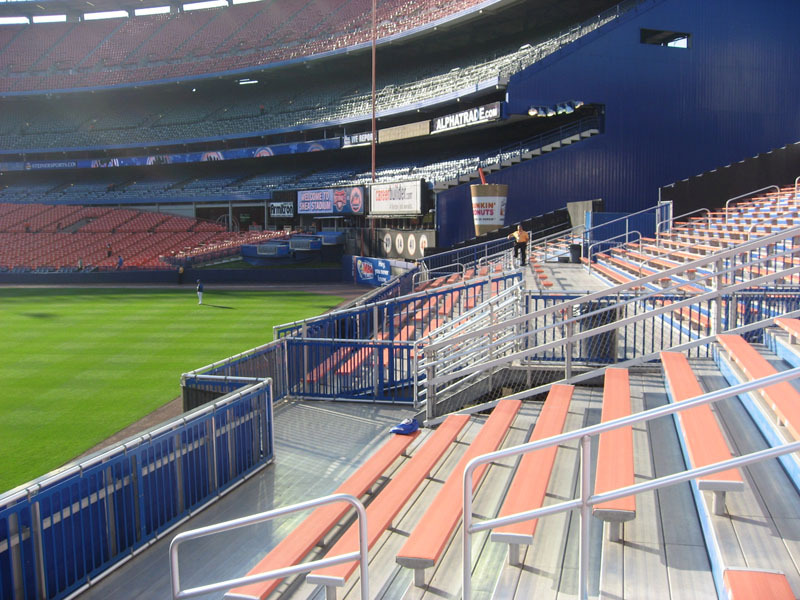 For example, there’s a concourse right above the double-decked bullpens in Philadelphia, a screened viewing area just behind the bullpens in Seattle, and bleacher seats surrounding the bullpens in St. Louis. 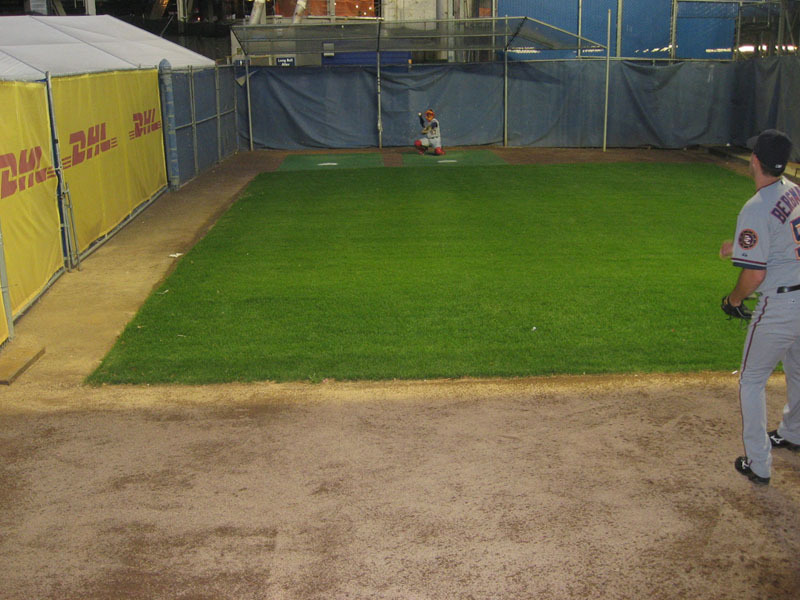 At AT&T Park and several other venues, the bullpens are nothing more than benches on the field down the foul lines. Does it cause any harm to have the players and fans sitting so close together? Did I cause any harm by reaching over that stupid fence with my camera? Umm, no, but because it was Shea Stadium, I got scolded by a security guard. Clif and Gail and I got some bottled water, then some ice cream, and finally headed up to their regular seats in the Mezzanine. Nice view. And here’s my Watching Baseball Smarter tip of the day. If you click the pic to make it bigger, you’ll notice that neither base coach is standing in his respective coaching box. In theory, there should be some type of penalty for that, but the rule is never enforced. The first base coach is standing on the outfield side of the box to give himself extra time to get out of the way of a line drive. The third base coach is literally risking his life by standing on the home-plate side of the box so that he’ll be in a better position to give signs if the runner on second ends up rounding third on a potential run-scoring base hit. After the first inning, Clif wanted to go for foul balls one level down in the Loge, and Gail had no problem with that. She stayed in her seat while Clif and I ran around and did our thing. The bad news for Clif is that I ended up being the one who got the foul ball. The good news for Clif is that he got a great view of my snag because he was standing right next to me. I swear I had no intention of catching it. 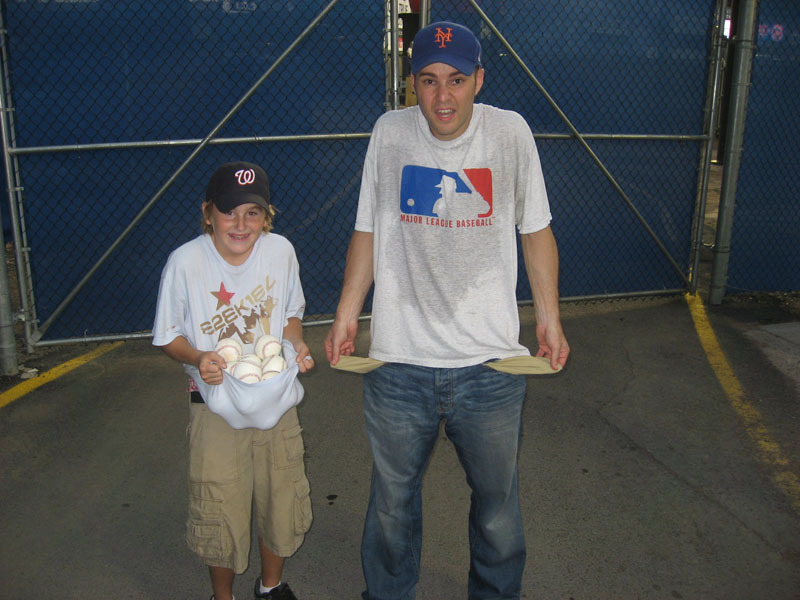 I’d been planning to step aside and let him go for any foul ball that came our way, but here’s what happened. It was the bottom of the second inning, Shawn Green was at bat, and we were camped out in a tunnel on the third-base side of home plate. Green worked the count full, and I told Clif to pay extra close attention because three balls/two strikes is a good foul ball count. Green ended up hitting seven consecutive foul balls, and the third one shot back straight over our heads. The tricky part about playing foul balls in the Loge is that when a ball goes over your head, you have to make a split-second decision. Move forward and look for the ricochet off the facade of the press level up above? Or move back for the catch in case it barely falls short of the facade and continues on its path? I’ve been up in the Loge for hundreds of games, and I still make mistakes, especially on high pop-ups that may or may not clip the facade on their way down. Those are tough. If Shea were going to be around for another 40-something years (God forbid), I still don’t think I’d ever master those. But I’ve gotten pretty good at judging the balls that fly straight back. Clif thought the ball was going to fall short so he moved back, and when he did, I knew he’d just cost himself a chance to catch it so I took a couple quick steps forward to the top of the tunnel, then turned around and looked up as the ball smacked the facade and bounced five feet over Clif’s head and into my glove. Everyone oohed and ahhed and gave me high fives for the “great catch” that I’d made. Clif and I secretly made fun of them because we both knew it was about as easy as it gets. The only tough thing about it, as I mentioned, was judging the ball off the bat. I offered the ball to Clif. He didn’t take it. Instead he texted his parents and told them what had happened. The Nationals, already winning, 8-3, after seven innings, scored a run in the eighth and another in the ninth to open a seven-run lead. The Mets sent 10 men to the plate in the bottom of the ninth and scored six runs and got Endy Chavez over to third base–but the rally fell 90 feet short. 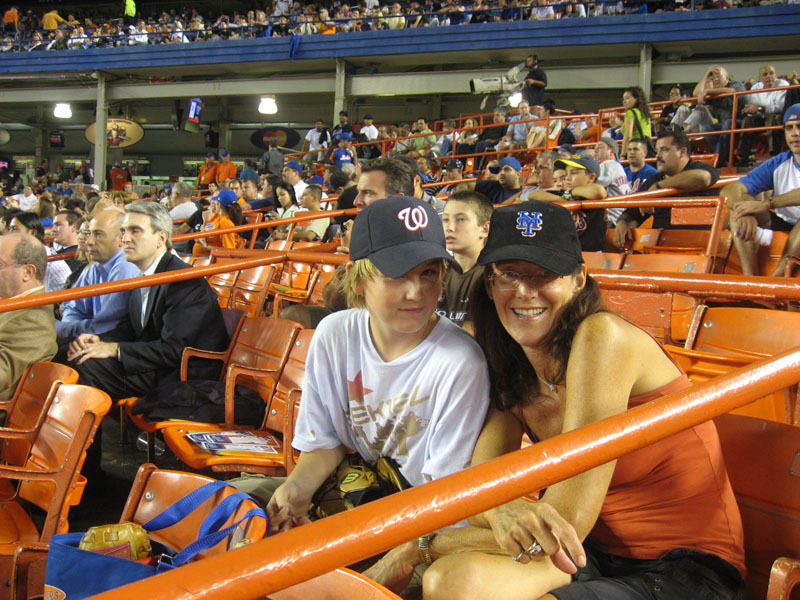 Final score: Nationals 10, Mets 9. Most of the fans had left before the ninth inning, but the few thousand that remained made enough noise to fill the cavernous-yet-cramped stadium. At one point, when the scoreboard indicated that the Braves had beaten the second-place Phillies, everyone started doing the Tomahawk Chop. That was pretty cool, and I briefly took off my Nationals cap to join the celebration. Anyway, the Mets’ comeback wasn’t meant to be, but it turned out for the best. Since I’d gotten the lineup cards the night before and knew exactly when and where and how and who to ask for them, I was able to position Clif at just the right staircase so he’d have the best shot at getting them. Once the final out was made, we rushed down to the front row, and I told him to yell at manager Manny Acta. Manny didn’t look up, and I wasn’t surprised. Everyone was yelling his name for different reasons. Some people wanted a ball. Some people wanted photos. Some people wanted autographs. Some people probably wanted his phone number. Simply shouting his name wasn’t specific enough to make him look up. I knew he could hear us, and I knew he needed to hear the entire request all at once. My only fear was that he’d remember me from the previous day, but I had to go for it before he disappeared back into the dugout. Manny looked up and saw that we were both wearing Nationals caps, so he pulled the cards out of his back pocket and slid them across the dugout roof. I grabbed them before any other fans had a chance to reach in, and I handed them to Clif. 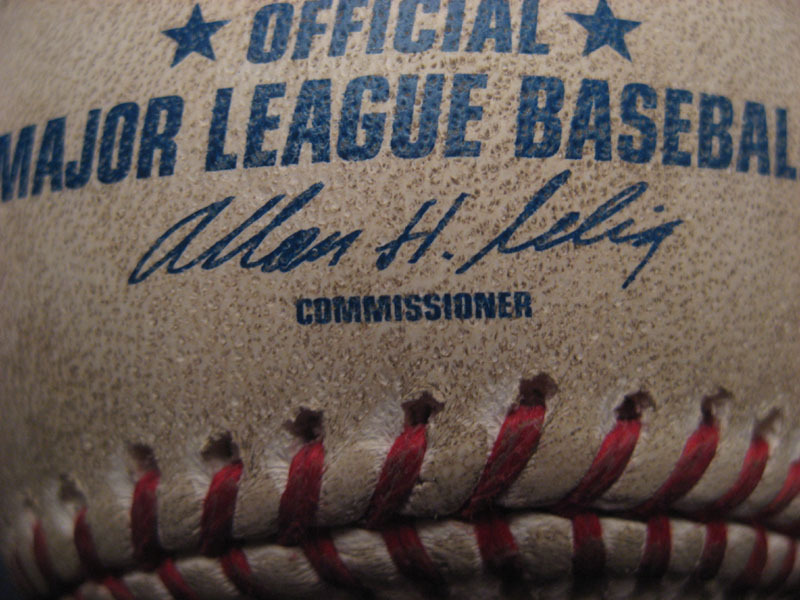 Oh, and by the way, Clif also got the ball that had been used to make the final out of the game. Austin Kearns, who had caught Paul Lo Duca’s fly ball in right field, tossed it to him on the way in. What an outstanding day. I’ve always wished I had a little brother, and for a few hours, it felt as if I did. • 303 balls in 37 games this season = 8.19 balls per game. • 73 lifetime games with at least 10 balls. 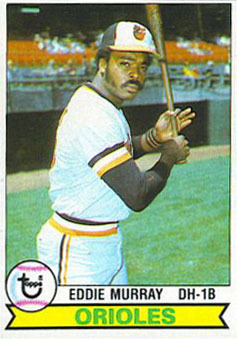 • 3,264 total balls…moves me ahead of Eddie Murray (3,255) and into 12th place on the all-time hits list. Next up is Willie Mays (3,283). Wow. You are taking baseball games to a whole new level. I don’t think there’s any other way to have so much fun at a baseball game (besides playing of course). 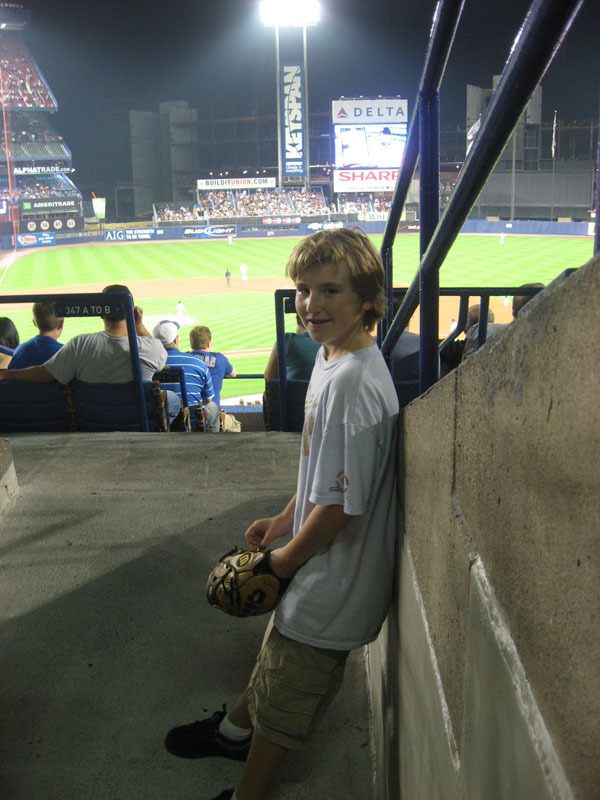 If I get a job and am allowed to take the subway by myself, I would definetly pay for a Wacth With Zack at Shea! Man, I wanted to see 300!! Maybe you’ll get 19 balls and get 322! Look forward to seeing you tommorow. Gate A right? Or is it Gate E? CLIF: Were you at any Islanders games last year, cuz I might’ve met you a couple of times? Are you gonna be at the Home Opener? Do you have any pucks? I remember a kid who looked like you and who knew the tricks around the arena, and was good competition. Zack, great entry, as always. I totally remember that Shawn Green at-bat. That was insane! Manny Acta comes through again! Amazing! I hope his team can sweep the Phillies this weekend though! OMG Tomorrow is Baltimore!!! I’m excited. I’m getting ready. I’m bringing about 10 Yanks ticket stubs, 1 O’s hat and 1 Yank’s hat, probably a glove, and probably rosters of both teams. I’ve got a long drive in the morning, so I’m hoping I can completely memorize them. My brother and parents are excited too. They’re looking forward to meeting you, finally going to Camden Yards, touring around, getting autographs, and a ton of stuff. See you tomorrow. I look forward to probably meeting you too. It’s great to be able to put a face to the e-mail addresses. hey that sounds great. congrats on 300 and congrats clif on your 7! 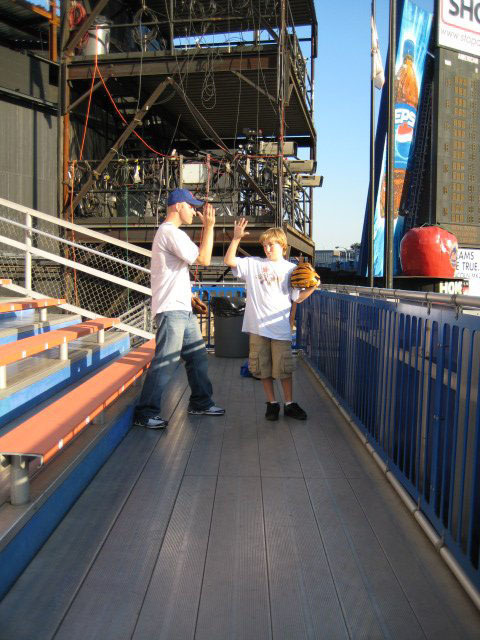 im goin to the mets game at shea tonight, but im goin with my friend so no bp. its ok because he invited me and it should be fun. the mets are so upsetting omg i cant take it anymore. 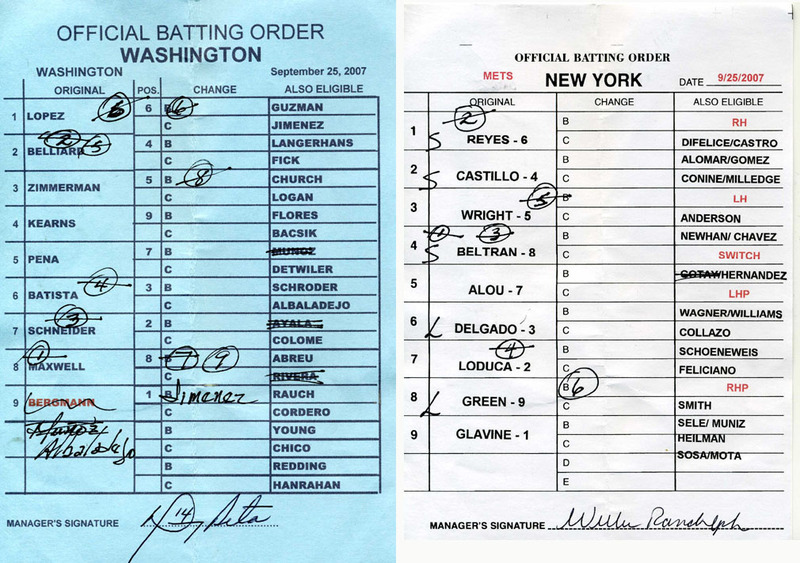 i grabbed the lineup cards… oooo yeeaah. that was THE best night of my life. Yanksfan, you are gonna have THE best time of your life. cool zack!!! you said i was your little brother!!! My 1 day high is still 2 :), someday, when I’m going to a game that the Cubs are NOT playing in, I’ll get hats of both teams and have a go. And Zack, At the last regular season Cubs game, Whenever the Braves took the lead (and eventually won) we had 40+ thousand people doing the tomahawk/cubahawk chop (the cubahawkchop requires a cubs hat). Not sure if I already mentioned this, but that day I got a ball from Corey Miller, a bullpen catcher who I’ve asked ALL SEASON for a ball. Thanks, yeah, I’d imagine it would be more fun to BE Nook Logan (for example) than to get a ball from him, but still, not bad. 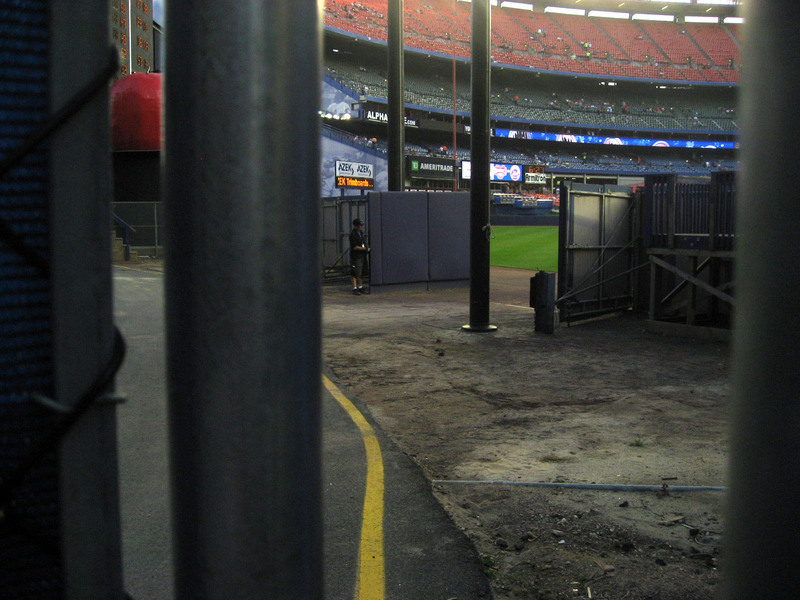 I should be at Gate H. That’s the one near the Babe Ruth statue and the ticket windows. Do you plan on getting a job next year? If not, we might have to save our Watch With Zack game for Citi Field, but whenever it happens, it’ll be cool to have you as an official client. I doubt I’ll get 19 balls tomorrow. I’ve never been able to get that many at Camden even with small crowds. Tomorrow’s game is probably going to be sold out. But hey…maybe a bunch of Yankees fans won’t bother making the trip down now that their team has clinched. I wish every hitter would hit seven foul balls. Can you imagine?! I heard a theory today on the radio that Omar Minaya secretly wants Acta to manage the Mets. I hope you’re gonna let me snag at least ONE ball so I can keep my streak alive. Question (because I forget if you already told me): Do you guys have season tickets for tomorrow’s game or regular box-office tickets? 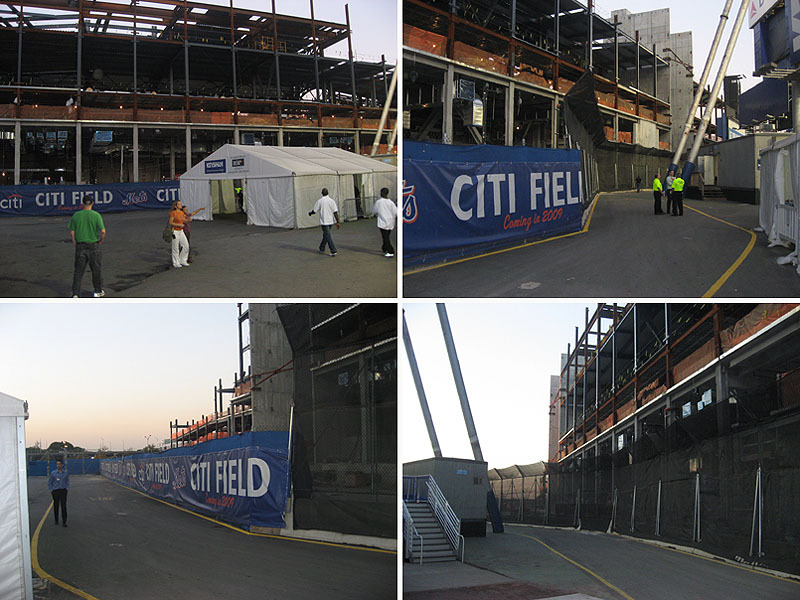 If you have season tickets (like, from StubHub or wherever), we’ll be able to get into left field at the start of BP. If not, we’ll be stuck in right field for the first half-hour, but that’s okay, because it’ll still be a decent place to snag. You should definitely bring a glove. Camden allows backpacks, so just bring a glove and throw it in your bag. You never know. Plus, if we go for an A-Rod homer during the game (which I highly recommend doing…because who knows how many more chances we’ll have to chase his bombs), you’ll want to be able to catch it. I’m looking forward to meeting all you guys, and YAY, the weather is supposed to be perfect. I have your mom’s cell phone number, and I’m pretty sure she has mine. If not, let me know, and we can figure it out in a private email. Oh, and I agree about putting a face to the email addresses…although I already know what the famous Puck Collector looks like. Thanks, but man, how can you stand missing BP? I wouldn’t even go to a World Series game if I couldn’t go early for BP…unless, maybe, I had seats in the first couple rows behind the middle of one of the dugouts. Are you sure YOU grabbed the cards? I thought I grabbed them for a split-second and then passed them right along to you. But if you’re sure, I’ll change that in the entry. Sorry. Didn’t mean to steal any credit for that. It all happened so fast, and I wrote the whole entry (over 3,500 words) so fast that I might have mixed up a couple details. I’m sooooo glad that you had such a great time. In case you couldn’t tell, I did too. I’ve met him briefly on the street, and he signed that days giveaway (a free shirt). And he’s a fan favorite. 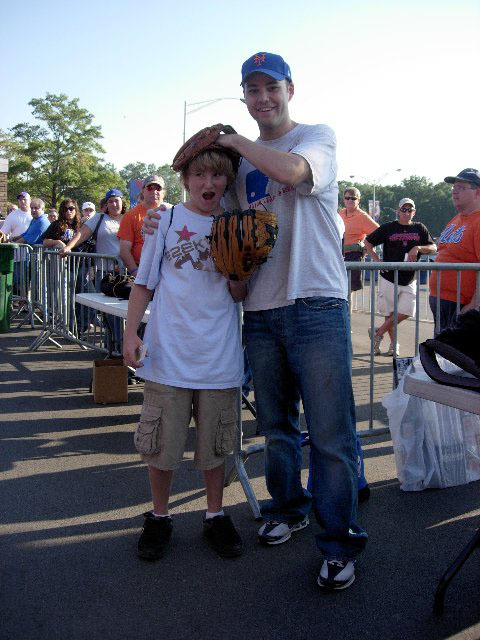 He is good about autographs and throwing balls. Well anyway, he ALWAYS throws up a ball into the upper deck after the Cubs are done with BP, and the only 2 times I’ve ran up there to try to be the person he throws it to, he completely missed the upper deck. No one’s up there, so IF the cubs make it (THEY WILL!) and IF you come (YOU SHOULD!) and if Ohman gets on the playoff roster (biggest if) you should run up to the upper deck about 5 minutes before BP ends, and as long as Will gets a good throw on it you should have a ball. No, unfortunately, they’re not season tickets. We’ll absolutely let you get a baseball. no its fine. if it wasnt for you i wouldnt have gotten them. That’s an excellent insight about Ohman and the upper deck. Thanks for letting me know. I hate it when players throw balls to me…and MISS! That’s the worst. No problem about the tickets. Excellent about the baseball. If you turn me loose for a little while and let me snag, I might be able to get a couple brand new balls for you to get autographed. But if you’d prefer that I stick with you guys all the way through and try to get an extra set of autographs, that’s fine too. I suspect that there won’t be anything to do for the first half-hour except snag. Like I said, we’ll be limited to the right (and center) field seats, and I doubt there’ll be any Orioles signing out there. That’s another reason why you should bring your glove. Dude! Thanks once again. It really did feel great. I never thought of it as “the next generation.”*****, am I getting THAT old? C’mon now, don’t settle for anything but the absolute truth. Let me know if I should make the change, and it shall be done. Just kidding Clif, I TOTALLY understand, some players can be snobby and stuck up (although not all) But Zack is down to earth, and loves talking baseball or about ball snagging strategies almost anytime anyone wants to. I wish the players would at least wave sometimes to acknowledge our existence. If you insist…and thanks. That’s really nice of you to say. I’m even more flattered than before. Meanwhile, though, our Mets are stuggling. Ouch! They’re losing, 7-4, in the sixth inning, and the dang Phillies are winning by three against the Nationals. Thank YOU too. Much appreciated. Yeah Zack, I am planning on getting a job next year. And I totally agree with you and YanksFan about putting the face to the name. I’m packing for tomorrow. It should be my last 2 BP’s of the year. There has got to be a way to sneak into LF during the first half hour. I’m gonna try, but last year it was tough. Clif, I think we hate the Marlins equally as much… although they didn’t beat Prior and Wood in your home stadium…. But I share your Marlin hate. Well I’m rooting for the Mets. I have Beltran and Wright on my fantasy team! The Cubs are the NL Central Champions!!! (I’m just rooting for the mets so my fantasy team can do well, lol) and I’d rather play them in the playoffs than the phillies, no offense. Remember… all you can do as a fan is believe. Trust me as a Cubs fan, when many times believing in the improbable is the best we had. Zack, how much is it to do the game with you? I am interested in possibly going to a game with you. by baseball standards youd be getting a good 5yr/100mil contract if you wanna go into it like that…your still in your prime man, youve got some great years left and i look foward to them and possibly being a part of them…im planning on a bunch of philly trips next year, so maybe lets sync our calendars and plan a day there? You should’ve gone to Shea Stadium in 1993. There was NO ONE there. But don’t give up on them just yet. Let’s see what happens later today (Saturday). The Phillies have Adam Eaton pitching, and he’s terrible. The Mets have John Maine, and he’s pretty good. So before you know it, we might have another tie in the NL East with ONE game to play on Sunday. Wouldn’t that be fun? If you somehow find a way to sneak into left field, I’ll be insanely jealous. You will absolutely clean up out there if you find a way in. Any idea about what type of job you might get? You’re rooting for the Mets because of your FANTASY team? Oh Lordy. Wow, I am impressed!! Way to score 7 balls, including the final out ball, and the line up cards!! I’m jealous of the line up cards again. I really need to score them next year. That was a really cool post about you and your day with Zack. Treasure the memories buddy. By the way, I have a nephew named Clifton as well. Don’t see that name too much. Quite unique!! Sorry about the Mets and the division but it’s not over yet. Adam Eaton does not pitch well as Zack says. Good luck. Your welcome for the assist. Padres beat the Brewers two days in a row and I get no love from you in the comments? I’m kinda sad about that. I’m glad your team made it to the playoffs again. I have a buddy in Florida that is a die hard Cubs fan and he called me CRYING after we won and put you guys in the playoffs. There is a chance that you guys could be playing is SD on Wednesday. Don’t know your situation, but I do have extra tix if it works out and you and your family come out here. I hope the Padres can win ONE MORE GAME or get the other guys to lose and get into the playoffs. I’m sweating it out. If it works out and you’re interested in the tix shoot me an email. Oh yeah, Wil Ohman is DESPISED out here in SD. Two years in a row he’s been a real jerk during BP and got into it verbally with people in the stands. I saw it with my own eyes. Not very nice. He did do the upper deck thing at the end of BP in SD as well. Good call on that for others to know. Another great post. What a special day for young Mr. Clif. To be 13 again huh? That was the best Watch with Zack post to date. I was so happy for the kid when I read he got the final out ball AND the lineup cards. Worth every penny that night. Great job. I’m sure we can work something out and hook up somewhere, somehow next year. Looking forward to it. I need your help. The Padres are so close to the playoffs. I need some combined wishful thinking from all of you to get my team into the promised land. I think we can do it. If we do, then I’ll have more chances to snag baseballs this year. I need to add to my playoff snag total and I don’t want to go to Anaheim to do it. Anyway, help me out guys!! Good luck to all these last two days. Have fun in Baltimore guys!! See you (and Yank’s fan)in 7 hours!! Leigh, you saw me celebrating, so I was obviously grateful. THANK YOU PADRES. I knew something magical would happen when Maddux and Big Z started on the same day. Zack: I have no other reason to root for another team… my team is finally in it this year! I’m heading off to Baltimore in about 30 minutes. Not sure if I’ll have enough energy to answer comments when I get home, but you know I’ll get to them at some point soon. Ahhh. Playoff worries. If anyone of you have watched Ken Burns’ The War this week–you’d know that our worries/problems/concerns don’t amount to a hill of beans compared to what these guys went through–and our boys in Iraq today. For example, my dilemma deals with playoff tix I have in Cleveland for Friday night. Should I fly out Friday on frequent flyer miles and get back early Saturday for Isles opening night? Should i just sell my tix on E-Bay? What if fly out and it gets rained out? A lot easier then knowing you’ll got shot at with machine gun fire and mortars when you land on the beach. The bottom line is that we should cherish such “difficult” choices and simply relax and enjoy the ride. See ya in a few hours Zack. Tonight’s crowd should be big, but there are lots of tix left for tomorrow. At shea how do you get autograph’s after the game .Where do you go ? Mets win, Phillies are losing. see Clif? DON’T GIVE UP HOPE! Phils lose! Mets again tied for first! The NL race is CRAZY! we could possible have FOUR teams with identical records. 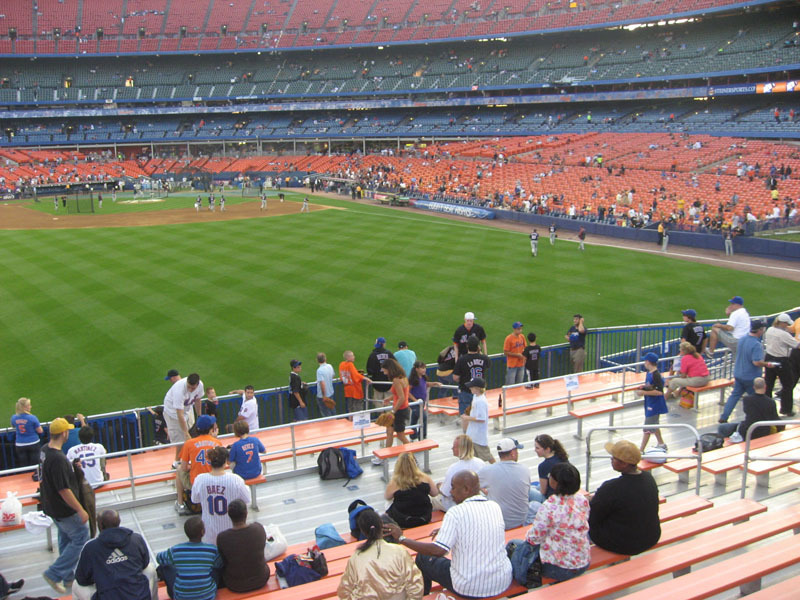 If this happened, I think the Mets would play the phillies for the NL East…. then the loser of that… I’m really not sure. I wonder if Zack knows. if the mets and phillies do the same thing (win or lose) than they will have a game on monday. if the mets win, phillies win and padres lose, than the mets and phillies still play a game and the winner wins the division and the loser plays the padres for the wild card. its confusing but thats what happens. if there is a deciding game in philly on monday, i have tickets so im goin to philadelphia. im probably not goin cause the mets are gonna win and the phils will lose. woah. win lose lose win if team A loses and team B beats team… never mind.. I just got back from Baltimore. I’m way too tired to answer comments and figure out tie-breaker scenarios. It was a good game. 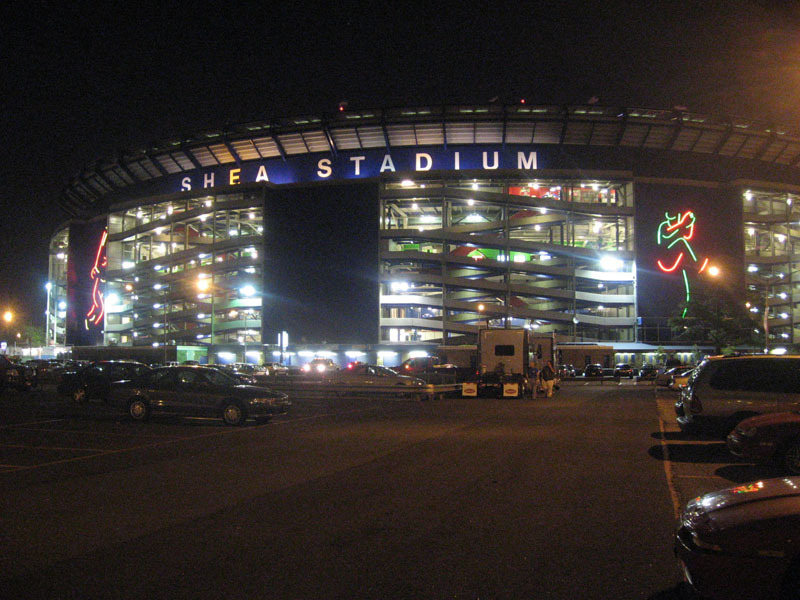 The blog entry will have to wait a day or so because it looks like I’ll be going to Shea later today…which means I have to wake up in five and a half hours. Goodnight! Looked like a crazy game in Baltimore. 12-11 Yanks. I bet you guys had fun. Hopefully, there were plenty of bp balls and foul balls for everyone. I’m sure you saw Trevor completely blow it for us today. That really hurt alot. Maybe we can get it done today? Good call on what’s really important, but I’ve already served my four years in the military and I’m a Padres fan!! I need a win!! Ha ha. I have watched some of that series and it’s pretty good documentary. Makes me think alot about what my uncles and grandparents went through. I’d try to do both Cleveland AND Islanders opener. You only live once. If you can afford it, I say go for it. Don’t give up hope, Mets fans. There is still baseball yet to play. Sorry about your Mets Zack and Clif….. You need better pitching. A special day all-around. Yes indeed! I’m surprised to hear that about Ohman, but he might be one of those guys who has too much personality for his own good. One-game playoff for the Padres! I know you were obviously hoping that it wouldn’t come down to this, but you have to admit that it IS exciting for all baseball fans. They eyes of America will be on your team. As for my game in Baltimore last night, it was definitely exciting baseball, but it was one of the toughest days to COLLECT stuff that I’ve ever experienced. I might have to refer to you as the “poop collector” if you get that job. Just kidding. I hope you DO find work and get yourself to lots more games. Must be such a great feeling. Mets fans are at an all-time low right now. It’s worse than losing 100 games because at least then, you KNOW all along that you stink and that your season isn’t going anywhere. Well said. Excellent perspective. I’m with Leigh in that I think you should go to all the games, if possible. As for big crowds…just wait ’til you see the pic on my next entry that shows the people lined up outside the gate in Baltimore. 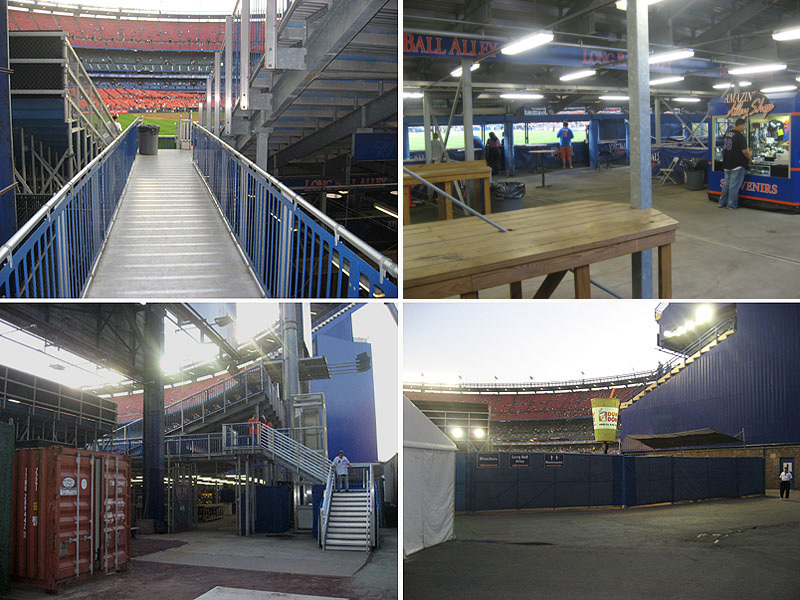 Press gate for the visitors, players’ parking lot (near the #7 train) for the home team. Nothing too fancy about it. Man oh man oh man. You were on top of all the one-game playoff scenarios…and all for nothing…at least for us here on the east coast. I’m sooooo sorry it played out like this, especially for you because I know how big of a Mets fan you are. Thanks so much! Sounds like you had a dream job. I once made it into Tiger Stadium well before the gates opened, and I ended up getting into serious trouble. I had been allowed to enter early (because of some work that I was doing), and I was even allowed to go for balls, but then I got so many that security demanded that I give them back…and let’s just say I didn’t go down without a fight. It was ugly, and I still look back at Detroit with disgust because of that incident…no offense. But that’s cool that it all worked out so well for you. Too bad you didn’t save the balls, though. I like the idea of the voice recorder, but I don’t think I’d really need it THAT often. The day I snagged 21 balls in Phoenix, it was definitely a challenge to remember when and where I got everything, but the rest of the time, I’m always able to find a few seconds free and scribble down a few words about each snag. Hey! What’s up! I had a great time with you guys. Sorry about the A-Rod incident. Sometimes those things just happen. Why it had to happen with HIM is just unbelievable. But listen…don’t say anything else about A-Rod or BP or the game. Let’s keep everything a surprise for people until they actually get to read about it in my blog entry. Okay? I did okay. “Bonus items” were surprisingly scarce. Be glad you weren’t there…and look for my blog entry about it in a few days. First I have to write about yesterday’s game at Camden Yards. You know, I never really though your Watching With Zack thing would work out, but it appears it has. 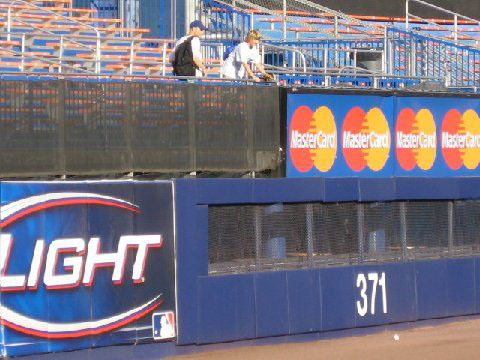 The funny thing about being scolded for ‘looking’ at the Nationals’ bullpen is that Citi Field is going to have one of those concourses(in fact, seats) right above the bullpens in right field.